Hi. I'm Jerry. In 2012, my family and I decided to make a move to Taiwan, my wife's home country, for a few years. I remember a year or so earlier that I was intending to sit down with my grandmother Margaret V. White and ask her some questions about our family's past. Ancestry research certainly wasn't my specialty. I had no knowledge of how to go about it or for that matter even the "right" sorts of questions to ask. But there was a seedling of interest there, although I cannot put a finger on the reason for this curiosity. Sadly, in the scramble to get things ready for the move, I never made time to have a serious conversation with her on the topic. We left for our new adventure, and over the next three or four years Grandmother's memory faded as well. 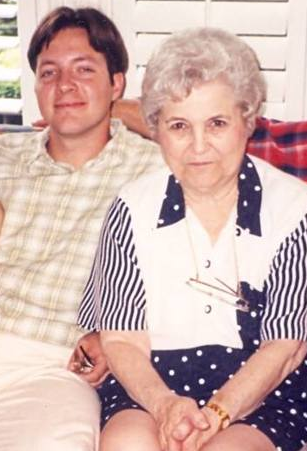 We returned home for a short visit in 2015, and after 95 years on this earth, my dear grandmother was just a few short days away from her passing on. My wife and kids and I did get to see her in the hospital one last time, but she was not conscious of our presence. She was gone by the end of that day. And though I have many memories of my time with her when I was in school, and some memories of the stories she told us about her life, I wish I had taken the opportunity to ask her some of those questions that perhaps only she would have had answers to. I guess this could be true for any of us with any of our relatives. For me, this was a signal to start investigating my family's past. I began as so many do these days with Ancestry.com. And I was amazed on two different levels. First, the sheer number of records - mostly names, dates, and locations - was so satisfying for me. I was the proverbial kid in the genealogical candy shop. And yet, I was also quite surprised to discover that no one has seemed to piece these names together in a way that made a larger picture of the "family tree". And so, I have taken it upon myself to do this. I realize that this is of particular interest for me because it stems from my paternal and maternal ancestry. But I also am aware of the fact that there are many others out there who might benefit from the things I discover in my own exploration, no matter how little they are. My hope is that you, the reader of these pages, will not only find that missing name, birth date, and birth location, but especially a story that intrigues and/or brightens your day. Again, feel free to contact me if you have any questions or comments.